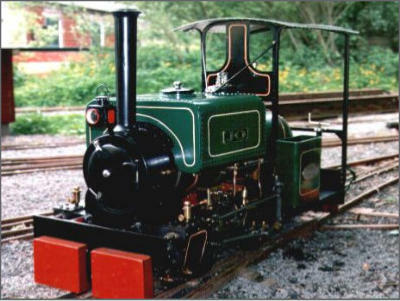 "JO", 0-4-0, Hackworth gear, built 1997 by Graham Howe. Martin Evans design, built by Graham Howe. This engine is has a silver soldered tapered boiler. The engine has been fired and run about 4 times only but successfully pulled a train of 5 passengers. Although the pistons have soft packing for rings the engine accelerates well when asked to and is great fun to drive. Fitted with steam brakes and water injector also made by the builder from scratch. Martin Evans design, built by Graham Howe. This was my first attempt at model building. The boiler is not silver soldered throughout and uses Comsol applied to nutted stays. The engine has only been fired and run a few times. This is Ken's latest model. The engine was built for the Neptune shipyard of Wigham Richardson & Co. from a conversion based on a steam tram engine built by R & W Hawthorn in 1880. See article about the challenge of making the 'Rocking Beam' This is the only photograph of the prototype in existence. The cylinders, pistons, rings and rod are completed ready for eventual fitting to the saddle. 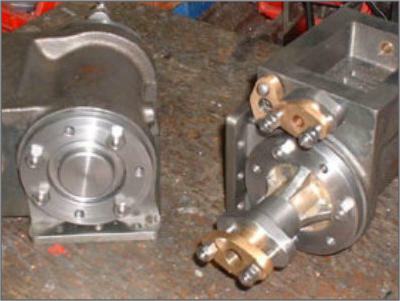 The back cylinder covers are fabricated from mild steel due to their complex shape a casting was not available. Eventually, the Neptune rolling chassis was 70% completed including the saddle, cylinder motion gear, hand brake mechanism, bearings for the reversing shaft, sand box and part completed internal water tank. The build has remained like this now for almost two years waiting for the outstanding drawings to make the boiler/firebox, valve gear, rods and super structure and so complete ready for fitting and testing. update I have decided that I shall not be able to complete the build for this engine and so have given my good friend Jack Dibnah the work in progress. Jack is full of enthusiasm and no doubt will extract the outstanding information from Ken Swan. Only condition, Jack keeps me involved with progress but if he wishes to finish it along different design lines to the 'Neptune' photo then no problem. What it is to be young and enthusiastic plus a good helping of engineering skills! The 'Seal' 15cc petrol, side valve engine designed by Edgar Westbury in 1947. At present the cylinder block is nearing completion with the bores made for the liners, valve guides, crankshaft and camshaft housings. I decided to put in phos... bronze guides for the tappet guides. As the block is less than 4" long, boring all the holes has been a challenge! Progress is slowly being made, the project started in 2002 and has remained dormant since 2004! The engine now has the crankshaft and pistons fitted and the valve gear is functional. The carburettor is almost complete and the distributor casing is made. I have devised a method for making the piston rings which are very fragile being only 0.030" section! (see article). I have decided to fit a copper tube to provide water cooling between the engine block and cylinder head rather than drill internal water passages. This can just be seen at the flywheel end. Next job is to save up for spark plugs and the ignition bits!